Starting to make progress with the website! Taking a closer look at the work that Neil Sadacca finished earlier today. From the left is a Kelly Quality hatchet with a nail puller that I received in a trade along with three axes from a trade I made with Dylan Launt from New York. Already in good condition, but just needed a bit of a touch up. 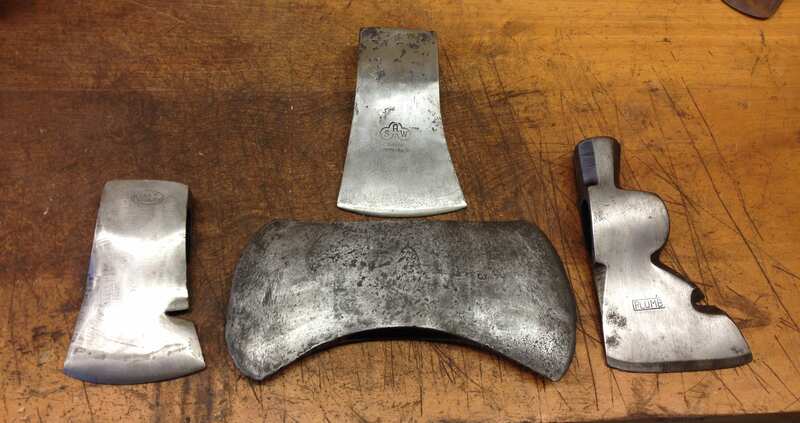 The goal with sanding these axe heads is to leave most of the aging character in an attempt to give the customer a restored axe that has been brought back to life! At the top is another axe from Dylan and it is a S.A.W. Wetterlings in a boys axe size. It has a faint amount of its original blue paint that is famous for many older Swedish axes. Although it is drop forged, it still should hold a great edge as the Swedes are known for using high quality steel for the blade of their axes. The middle one is a double bit marked Zenith Cold Test Marshall Wells. I have sharpened a Zenith Cold Test hatchet before and found that they hold a really good edge! It came with a reddish coating, which leads us to believe that it was likely thrown in a fire in an attempt to remove the handle in order to get the axe head by itself. So, it took a while, but Neil managed to sand it down and give it a better finished look. Based on your thoughts, Thrane Axe and Saw Co. could and will incorporate axes that are finished to a polish, but currently we desire the rustic look instead. Last but not least, is a Plumb roofing hatchet. These are very versatile as it can be used for chopping, hammering nails or tent stakes, and has a nail puller, but I have found the nail pullers on most hatchets do not work as well as maybe they were intended to. All of these axes can be restored in full with a new hand carved handle out of either ash or maple to your desired length, a handmade sheath to fit the particular axe very snug, which can be dyed either black, saddle tan, dark brown or left a natural vegetable tan color, a new razor sharp and polished edge, the Thrane Axe & Saw Co. makers mark, and a number on the end of the handle to be used to catalog and verify the axe if need be in the future. Thanks for reading and be sure to check out this website as well as the Facebook page periodically to stay updated on all axe and saw related activities at Thrane Axe & Saw Co!